Evidently, the trick to getting my hubby to eat meat loaf is grilling it. He hates meat loaf. Doesn't matter how good a loaf it is, he'll only grudgingly choke it down. Well, he had two huge slices of this one! Yay! I love meat loaf, so I'm a happy camper now. Because the temperature of a grill can fluctuate, please utilize your meat thermometer. It makes all the difference in over or under cooking your meat. I followed this recipe from Taste of Home, but changed a few things and cut it in half. 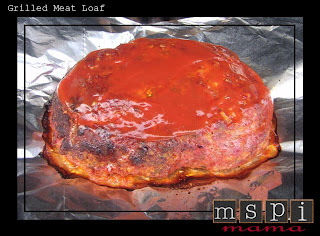 If you have a favorite MSPI-friendly meat loaf recipe, I'm guessing you could easily grill it, too, by following this method. It's great to keep the heat out of the kitchen! In a large bowl, combine the first nine ingredients. Crumble beef over mixture and mix well. Shape into one loaf. Take a sheet of heavy-duty (or fold in half a sheet of regular) foil and place it on a plate. Place meat loaf on foil (do not seal foil). Slide the foil onto the area of the grill that doesn't have direct heat. Grill meat, covered, over indirect medium heat for 50 minutes or until meat is no longer pink and a meat thermometer reads 160 degrees. Brush top with additional ketchup if desired. Let stand for 10 minutes before slicing. Yields four servings. A note about Worcestershire sauce: In the past, I've always substituted A-1 Sauce for Worcestershire because I just assumed all Worcestershire sauces had soy in them. But some of them are MSPI-friendly -- including the Lea & Perrins brand! Thank you to reader Jason for sharing this with me. Yummy! That sounds really good. Great Value brand (from Walmart) Worchestershire is safe, also.